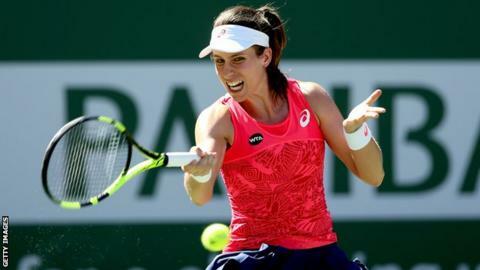 British number one Johanna Konta is out of the BNP Paribas Open in Indian Wells with a 3-6 6-3 7-6 (7-1) third-round defeat by France's Caroline Garcia. Meanwhile British number three Kyle Edmund lost to defending champion Novak Djokovic 6-4 7-6 (7-5) in round two. It ends British interest in the singles after Andy Murray and Dan Evans lost. Konta, seeded 11th, broke Garcia in the fourth game but the 21st seed levelled the match and dominated the third-set tie-break, winning it 7-1. Garcia, who was once described by Murray as a future world number one, showed impressive resilience to recover from a set down against Konta and sealed her win and a place in the last 16 with a powerful cross-court backhand. "There were a number of shots that let me down. Quite honestly, I don't know why, but I'm keen on improving and doing better next time," said Konta. "I didn't do enough with the opportunities that I did get. Some of the break points, she served well, and others, I wasn't brave enough. I don't think I did enough to really take them. I was a little too passive in parts." Edmund lost the first set in 42 minutes against Serb Djokovic but won the first three games of the second and served for the set at 5-3, before the five-time champion fought back to seal the match. "I think I played very well in the first set," said Djokovic. "Second set was obviously up and down. But credit to Kyle for playing some really aggressive tennis. "He made a lot of winners in the beginning and midway through the second." The world number two will play former US Open champion Juan Martin del Potro of Argentina in the third round. Australian Open champion Roger Federer needed only 52 minutes to reach round three with a comfortable 6-2 6-1 win against France's Stephane Robert. World number six Rafael Nadal secured a third-round tie against fellow Spaniard Fernando Verdasco with a 6-3 6-2 victory over Guido Pella of Argentina in one hour 20 minutes. World number 60 Donald Young was a surprise 6-3 3-6 6-3 winner against fellow American Sam Querrey, ranked 26. Konta played without her usual fluency and, although she served better in the final set, she could not take any of the three break points and was outplayed emphatically by Garcia in the tie-break. The best part of four weeks off tour resting a foot injury may explain some of the rustiness, and - like Andy Murray - Konta now has virtually two weeks of practice stretching ahead of her before she plays her first singles match in Miami.